Shine America is a world leader in developing compelling scripted and unscripted television and digital content. They’re best known for popular and award-winning hit series including The Biggest Loser, One Born Every Minute; long-running scripted hits The Office, Ugly Betty, and The Tudors. ‘Million Dollar Dog’ is the name of a gameshow concept. Shine America came to us as they wanted their concept drawn up as a storyboard to pitch to their prospective funders. The client had a clear brief for each frame of the storyboard required. It began with a dog owner at a pet shelter, who was surprised by the host, letting them know they were about to be a part of new gameshow. We then see our host on stage. 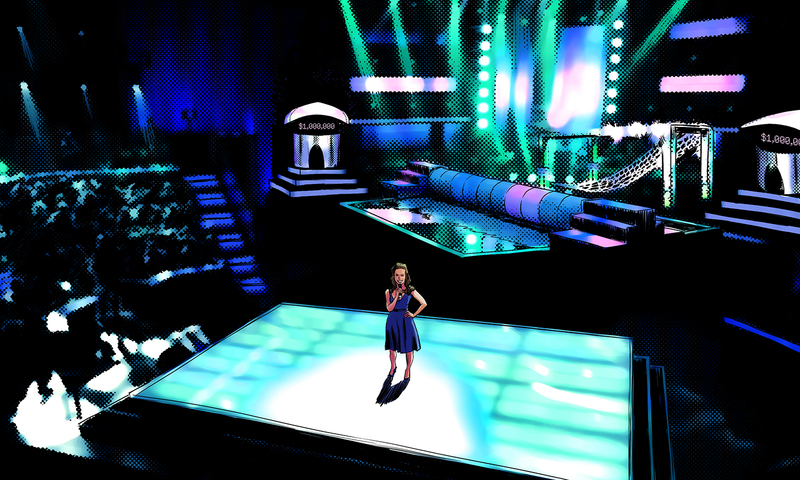 This needed to look like a big, sleek gameshow, with a pool coming out of the stage floor and all sorts of potential challenge course items in the backdrop. 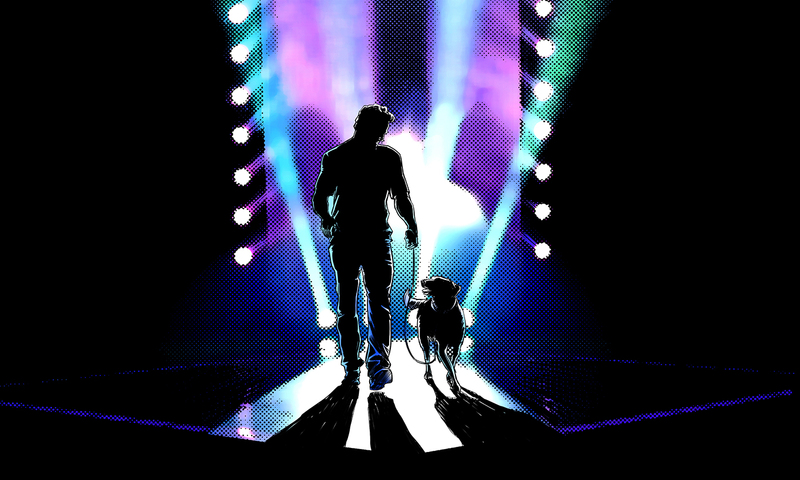 The dog and owner then entered the stage, almost silhouetted by lights on both sides. 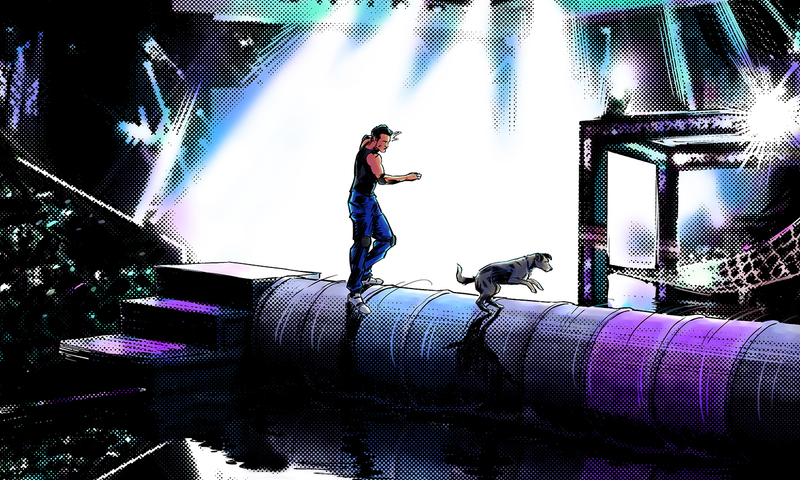 Illustrations were needed of an elaborate course in the gameshow, with the owner/contestant and dog making their way across it. 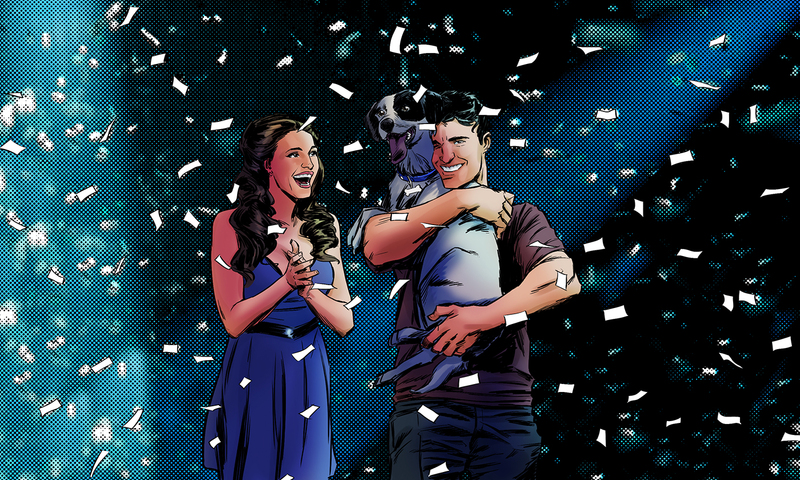 The final part of the storyboard, after the contestants had won the challenge, was of the dog choosing a prize. 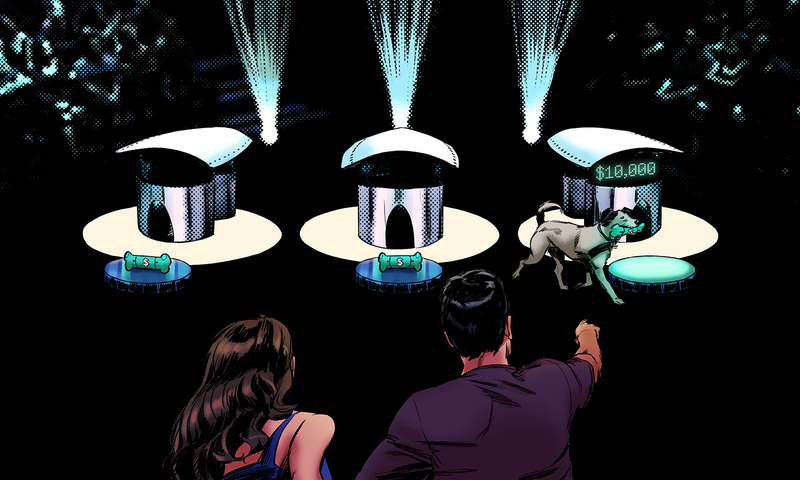 Our client wanted an illustration of the dog selecting a bone from a display in front of a sleek vault-looking dog house, with a prize fund clearly visible. The host would be on stage next to the owner/contestant, who would be yelling out to the dog and pointing frantically to indicate which bone to pick. The final shot would be the dog and owner celebrating on stage with the host. It was important to make the gameshow scenes very dramatic, so we went with a lot of contrast - a lot of black ink and stark lighting. 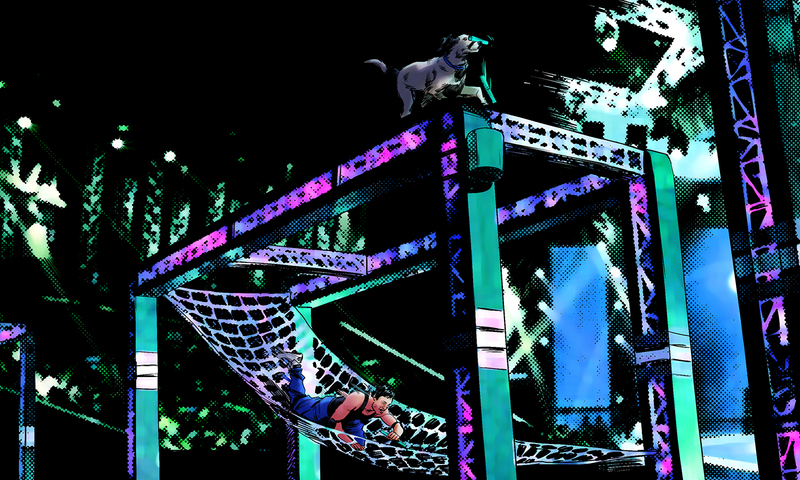 To sell the idea of the show, we needed to make the illustrations fun and exciting and full of action. The final shot of the owner and dog winning the prize money needed to be emotional and climactic to give the impression that the show would be full of highs and lows and drama.